Cindy, I just got through reading some of the web pages. I read the older ones I dont know how many times. Sometimes when I missed her I would get online and read them and look at the last note she wrote, and the things she made. I remember we used to dress up and put on little modling shows for our families. Me and Michelle were so close and so alike in so many different ways. We make up songs, do skits, play house and all the stuff we do when we are little girls. Sometimes when I go to my grandma's house and we pass your old house it bring tears to my eyes, we always used to play in the front yard and on the porch. I swear I could see her standing there with the dog. Augest 24 and November 5th are hard days for me sometimes, I know she is in a better place but I still miss her and always will. I did a report on her at school and had a hard time with it. It was the week that she had past away and so it was very hard to present it to the class with out crying. 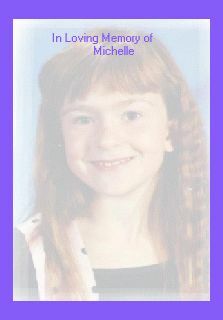 We all loved Michelle so much and I know when I die I will see her face in heaven again. Well I should get going, I need to clean up my room before my friends get here. Love always, Elizabeth Naomi Cromer, January 16th 2000.